The terms organic, sustainable and biodynamic seem to be all the hype whether we’re talking about food or wine. Every brand that is certified under these labels boast proudly their practices for all to know. So what is the difference between organic and biodynamic wines? The laws vary from country to country, but in Italy organic wines relate to what each winery is doing within the vineyard themselves pertaining to the grapes and the vines. Overall it includes no use of artificial or chemical herbicides, pesticides or fertilizers as well as no GMO’s. Biodynamic wines on the other hand go deeper into not only involving the aspects of what organic wines do on the front end, but also include what takes place within the winery and the production of the wines themselves as well as the larger ecosphere. It is meant for the wineries to intervene at a minimum with altering the natural characteristics of a wine being produced including adding yeasts or added sulfites. It gets a lot more complex as well, but we’re not going to get too technical here today. It’s interesting that many wineries within Italy aren’t labeled as certified “organic” or “biodynamic”, but take part in these practices. It could be for a number of reasons that they don’t pursue these certifications with money and time being some of the larger factors. In the US many folks live by these labels, but in countries like Italy this has been their way of life for years. Personally, I have great respect for the wineries that honor their land and these practices, but I feel it’s also about the end product and I do believe some wineries use this as a marketing technique. 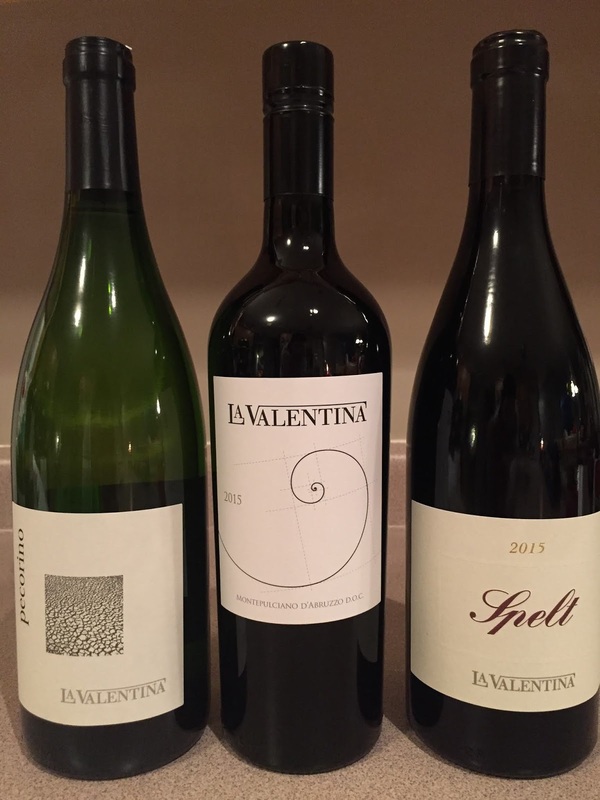 Today I’m featuring La Valentina from the wine region of Abruzzo located in central Italy. Abruzzo is a land dominated by rugged mountains, the Gran Sasso, and hills occupying 2/3 of the region’s land with the rest consisting of plains along the Adriatic. Even though their goal is produce quality wines, they care most about being authentic and showing to others their expression of the land. They adhere to the rules of sustainability and make sure that it is encouraged in every aspect of production and care for the land and the grapes. 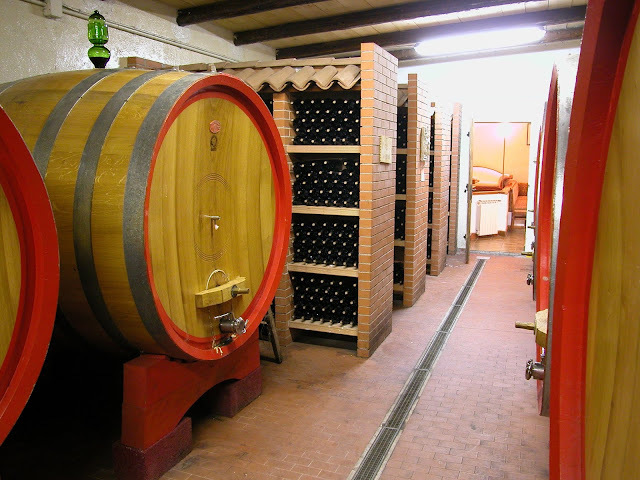 La Valentina works with many of Abruzzo’s indigenous grapes: montepulciano, trebbiano and pecorino. Montepulciano is a highly recognizable red grape found on the market, but there are plenty of low quality montepulciano out there as well. Some wineries, including La Valentina, have tried to turn that perception around by producing wines like the ones I’m sharing with you today that allow this grape to shine when produced in the right hands. This grape is not to be confused with the town of Montepulciano located in Tuscany that produces Vino Nobile di Montepulciano not even made from montepulciano, but a clone of sangiovese. It’s deep in color almost purple at times. A dry, medium bodied wine with rather soft tannins and ripe, juicy fruit. 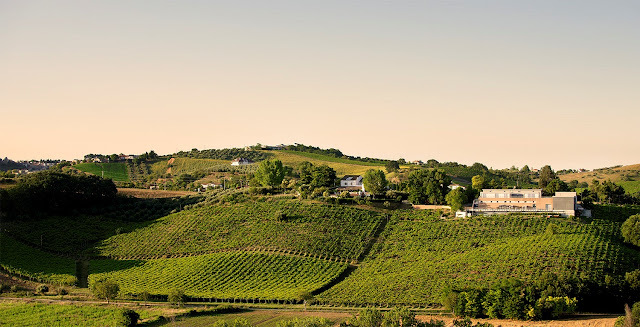 Some of the best, more complex fuller bodied montepulciano come from the northern part in Teramo. Pecorino on the other hand is a white grape with it’s home found in the Le Marche and Abruzzo wine regions. Mike Madaio shares a great story on Palette Press that the pecorino grape was almost extinct until vintner Guido Grifoni of Le Marche rediscovered the grape and experimented with the vine cuttings locally. He then located others in Abruzzo that believed in the potential when others back in Le Marche had turned their heads at Guido. Known for its high acidity and aromatic notes pecorino is a wine that pairs well with the local cuisine of seafood and softer sheep cheeses. Pecorino after all is mentioned to stem from the word pecora, meaning sheep, that graze the lands. Made of 100% montepulciano. Deep ruby in color. Lots of black fruit on the nose: blackberries, blueberries and black cherry, almost Dr. Pepper like. Medium to fuller bodied with juicy dark fruits on the palette. A crisp, mouthwatering acidity with firm tannin and toasty vanilla with a moderate finish. For an SRP of $14 this wine is a really good value. I’ll be writing about a biodynamic producer next month as I feature the wines of Alois Lageder so be sure to check back. I’d love to hear your thoughts on organic and/or biodynamic wines and whether this is something you prefer or don’t have a preference for either way. This Saturday, the Italian Food Wine Travel group are investigating Italian Viticulture. We'll be discussing what we learned on twitter using the hashtag #ItalianFWT at 11a, EST. Jill Barth of L’Occasion: "Gravner: 'Nature As A Source Of Thought'"
Jeff Burrows: "Looking Beyond Biodynamic Certification at Cantina di Filippo" at Food Wine Click! Lauren Walsh, The Swirling Dervish: "The Wines of Alois Lageder: Cultivating Nature as a Habitat of Life." Nicole Ruiz Hudson is Cooking to the Wine: "Arianna Occhipinti SP68 Sicilia Rosso with Creamy Eggplant and Tomato Zoodles"
David Crowley of Cooking Chat: "Mushroom and Short Rib Ragu with Sono Montenidoli"
Host Gwendolyn Alley the Wine Predator: "La Maliosa Biodynamic Procanico and a Pasta Bar with Uni and Mussels"
Spot on, Jen! I do feel that, in many other countries, organic and biodynamic are just the way they do it. I think we definitely need to do out due diligence and track down wines (as all ingestibles really) and make the best choices for our bodies and our planets. I explaining 'organic' to a friend who just moved here from Ecuador. She was stunned. "All of our food is organic," she said. "Pesticides are TOO expensive to use and silly when you have natural ways to do all of those same things." So true! It's amazing how different we operate than other countries. I was just reading yesterday how Italy is the 2nd healthiest country in the world. Everything is simple eating, pure fresh products.....it's not surprise. I especially enjoyed your post because you featured the wines of Abruzzo, which I don't think receive enough coverage. The first time I tasted Pecorino I thought I had gone to heaven! Going to have to check my local shop to see if they've got any La Valentina offerings in stock. Very true Lauren that Abruzzo isn't featured enough. If it is it's mostly montepulciano, but there is so much more. I know organic and biodynamic are used by some as a marketing technique, it seems much more likely to be authentic when it's a smaller family run winery. It's too much work just for marketing! I totally appreciate the efforts of these wineries to put the attention into their vineyards and that bare the cost to do so. Love La Valentina wines! Your comment about many folks in the US living by organic or biodynamic labels seems true. I recently read an article discussing people who may not know much about wine but they won't purchase it unless it says organic or bio on the label. The challenges of marketing for those who have done it that way with all along. This was a great topic! I'm always reading labels as I don't trust many of these companies now-a-days unfortunately. I find that supporting these small family run operations is the way to go with both food and wine purchases. So much loving, tender care in their products. Supporting the little people is so important. We often read of siblings working together in family wineries but not often do three brothers start a winery together! Cool story! I love the generations of families that are involved in the wineries in Italy. I am not a wine expert although I do drink a lot of wine ! But a friend of mine who is in the know tends to turn up her nose at wines labelled 'organic' in Italy because, says she, it does not really say anything about the wine per se, only about how the grapes are cultivated etc. 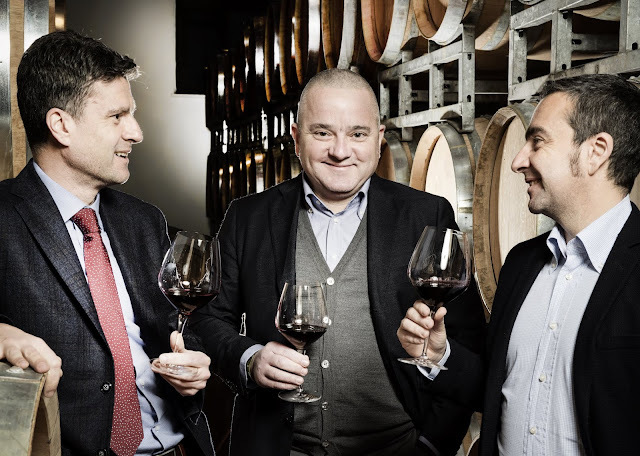 Besides, the Italian vinification and wine making regulations are so prescriptive (much stricter than they are in other European countries and elsewhere) that the organic add-on does not always really 'add' to the drinkability of the wine itself. This is not to knock organic farming methods, by all means! On the contrary. It's just to echo your thoughts on how the label 'organic' can be misconstrued as a marketing tool. Even though everyone has a formal certification process to go through to earn the title of producing organic wines I feel it's different in Italy than it is here in the US since so many farmers in Italy have been doing this long before it became "a thing".